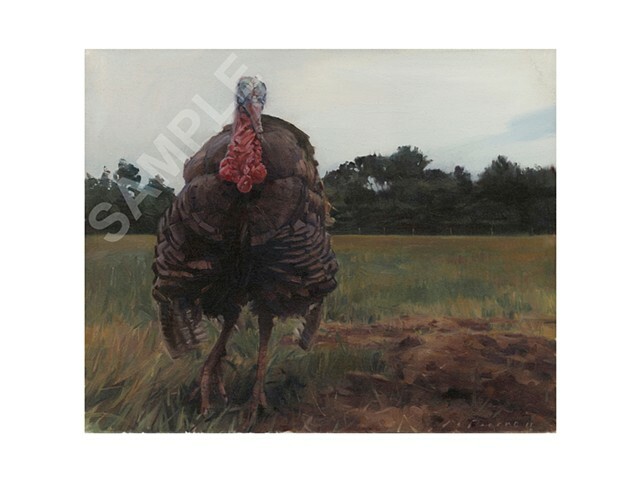 Limited Edition Print of "Timmy" from the Sanctuary Animals Series. Timmy was a heritage turkey who was raised to be slaughtered for food, in a residential area of Wappingers Falls, NY. Once he started to wander from the property, an enraged neighbor threatened to shoot him and another turkey named Tommy. Woodstock Farm Animal Sanctuary intervened and managed to rescue Timmy and Tommy from this terrible situation. Both turkeys lived out their years in peace, free to roam around the sanctuary as they pleased. Timmy died in February, 2014, but made quite an impression on those who ever visited the sanctuary. With a friendly and curious disposition, Timmy was often the first animal that visitors would encounter as they entered the sanctuary. This ambassador not only for turkeys, but for all animals, shattered quite a few preconceptions. After a short time spent with Timmy, people who had previously never seen a turkey up close, must have felt like he could have been just like anyone's cat or dog; Turkeys have personalities too.